If you are a senior citizen or are living with an older adult, it is extremely important that your bathroom is set up for proper safety. Due to the nature of bathrooms, the hard flooring combined with wetness makes the risk of falling very high. Every year thousands of senior citizens are injured as a result of bathroom falls. Luckily, it does not take a lot of effort or money to update a bathroom for safety. Simple purchases, such as a shower stool, and small improvements, like making sure that all bath faucets are easy to reach, go a long way towards improving your bathroom's safety and preventing falls. Making your bathroom safe is easy. Buying a quality bath mat is a simple way to help prevent falls. Bath mats are stickier than tub surfaces. A shower bench and stool are perfect for older people who are at risk for falling. Instead of standing up while showering, stools allow you to sit down and relax. If you do not wish to install an entire bench, a simple shower corner stool may be enough. It is also a good idea to attach grab bars that provide something for you to hold onto when getting in and out of the shower. 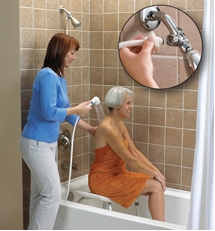 Make sure that your bath and tub faucets are easy to reach and not too difficult to turn. It is critical that your bathroom is safe and secure. Luckily, updating a bathroom's safety is easy and relatively inexpensive. Take the time to keep you and your family safe.